me to adapt the technique to the human body , and combine it with a tattooedimage executed as in japanese ukiyo-e (woodblockprinting). Then I create a tattoo for this particular persons edition of ‘’Gyotaku’’ prints. 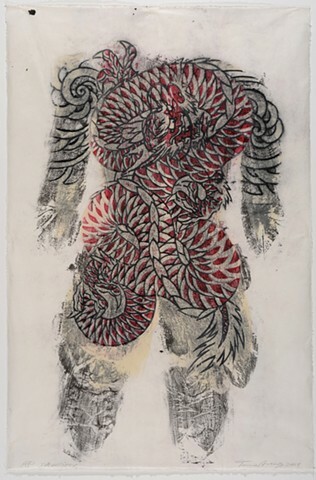 The Tattoo is carved as woodblocks, inked and printed as in traditional Ukiyo-e printmaking. In Japanese history there is a tight link between Ukio-e and tattooing.